SAFE REFUGE: The feast of the Holy Family of Jesus Mary and Joseph is celebrated on Sunday December 30, 2018. Families are responsible for the safety and upbringing of their children. In our day, as in the time of Jesus, there are refugees seeking sanctuary in traditional and untraditional places. Today, we remember the holy family’s flight into Egypt just as the Jewish people remembered Joseph’s flight into Egypt. 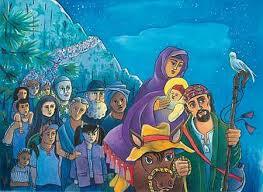 We also celebrate Jesus’ return to his homeland with Joseph and Mary. Seeking a safe refuge tests a family’s strength. The Lord is our refuge and strength. Kyrie eleison!